Just under the feather boas, Mueller Park’s dark underbelly. 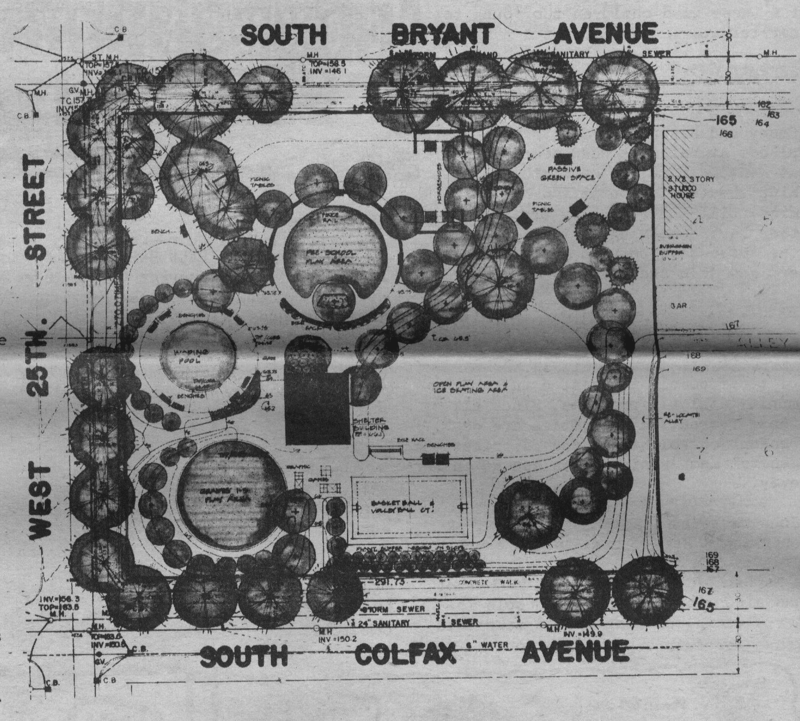 The 1974 plans for Lowry Hill East Park (as Mueller Park was originally known) put the basketball court on the western side, along Colfax Avenue. Two hoops were available for full-court play until they were demolished as part of a park renovation that began on May 4th, 1998. The newly renovated Mueller Park opened later that summer with one half-court hoop, located on the Bryant Avenue side of the park. Considering the events of the intervening years, those of us who live in the neighborhood today are lucky to have any basketball court at all. Lowry Hill East Park plans, 1974. 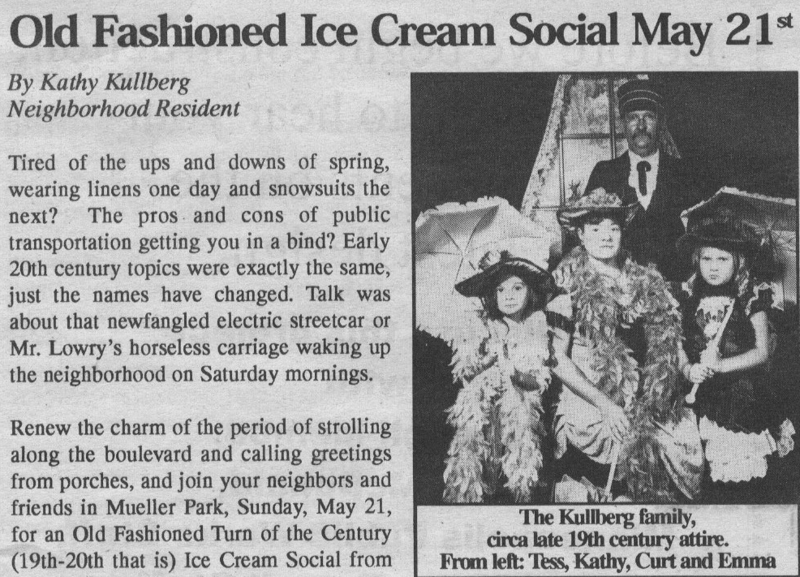 Mueller Park hasn’t always been about free piano concerts and historically accurate ice cream socials. 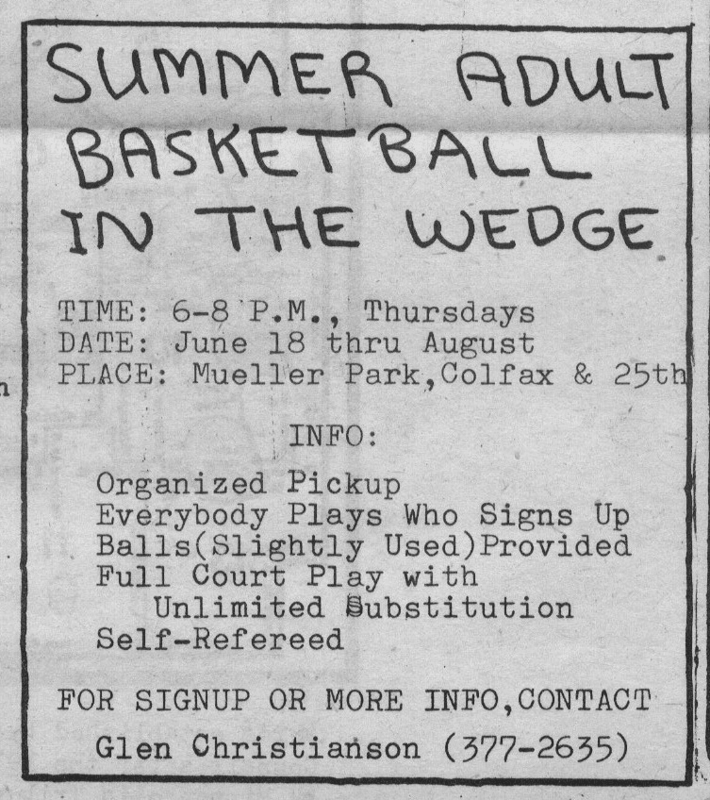 There was a time, as the Wedge newspaper tells it, when Mueller Park was dominated by basketball-wielding “ruffians” and sharp-shooting “toughs” raining chaos down on the neighborhood like a barrage of Ray Allen 3-pointers. We have witnessed children with BB guns, knives and air rifles. It occurs to us to ask where the parents are. At any given time there seems to be about 30 or 40 children playing at the park but at the very most 2 or 3 parents. 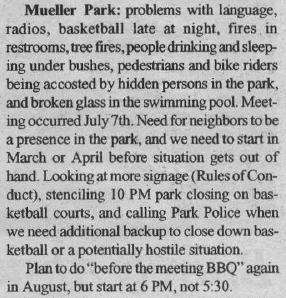 Towards the end of their letter they caution parents, “There just are not that many things for older children to do at the park.” Which is an odd starting point for what would become a decades-long push to remove the basketball hoops from Mueller Park. Behavior in 1980 was good. I’m not sure where our current neighborhood nostalgia for children and families comes from, because the children of the late 1970s sound like the meanest little bastards the world has ever known. In June of 1979, resident Mary Atkins describes seeing two 8 year old boys taking up sledgehammers to destroy “everything in both bathrooms.” At the end of her letter, Mary vows to keep “watching, phoning, and getting angry until someone listens!” She would go on to become an integral part of the LHENA “Park Watch” program in the early 1980s. Last summer, and again this spring, I have noticed that the basketball courts at Mueller Park have been completely taken over by adults, many of whom I do not recognize as residents of the Wedge. On May 6th, 1981, the same month Mary’s letter is published, there is a public meeting; “the hottest item on the agenda was the issue of the basketball courts.” Mary alleges “physical aggression by adults” towards children. Dennis Tuthill suggests removing the courts. Another resident, David Forney, advocates lowering the baskets “to discourage ruffians from outside the neighborhood.” Neighborhood hero Glen Christianson stands up for basketball, while pointing out the shortage of hoops available in the city; “Let’s not tear it down,” he says. Outside of Mary’s incredible accusation of violence against children, which is absent from her just-published letter, there’s not one specific allegation of criminal behavior. So, what is it about these basketball players–ruffians… many of whom I do not recognize… descending on our park by the carload… music on full blast? Suddenly, “ruffian” doesn’t seem like such a cute word. Ostensibly this started as a quest to preserve the basketball court for neighborhood children to play basketball. But Dennis’ solution is to reserve the court for Tuesday evenings of adult volleyball. 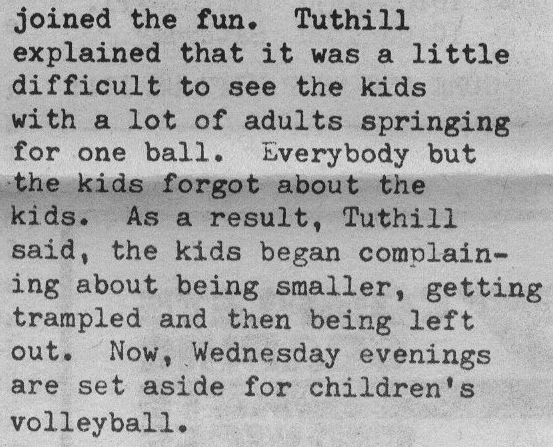 Mary Atkins organizes Wednesday night volleyball for kids (volleyball really is the antidote to basketball). Glen Christianson, legendary neighborhood rim protector, organizes pickup basketball games for adults. And there’s this excellent suggestion from the following year: “roller skating to music on the basketball courts.” Hilariously, I can find no trace of anyone ever suggesting they reserve the court for children’s basketball. 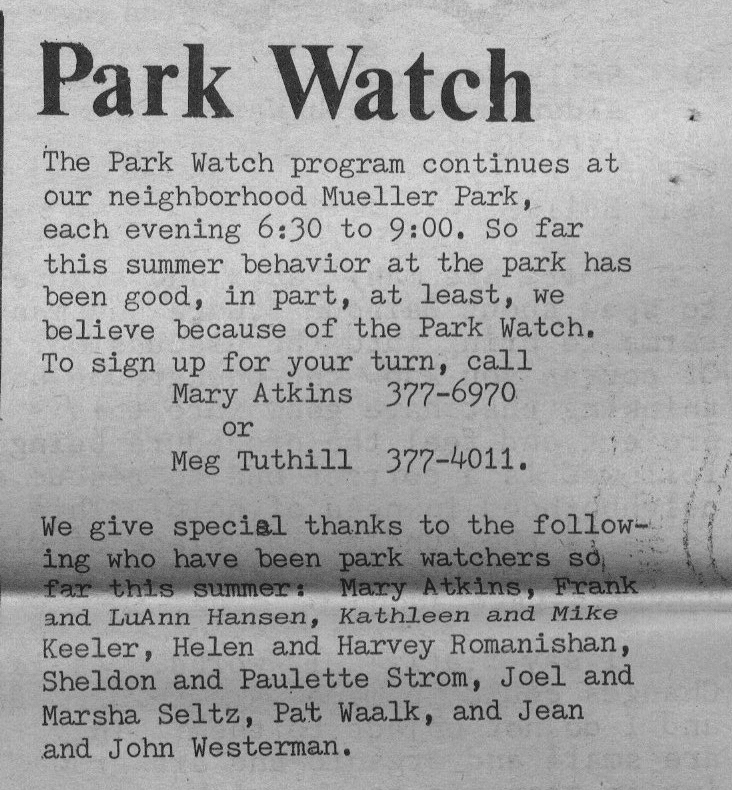 Park Watch continues through the summer of 1981. A September article announces that neighbors “have helped solve the problem about the use of the basketball court and the park.” Mission accomplished, but how? Park Watch. Mary Atkins’ eyeballs are the best deterrent. It’s not just the blacks. These teenagers, white and black, need better coaching; shooting the ball with a beer in one hand and a marijuana cigarette in the other won’t get you to the NBA. Both Atkins and [Dennis] Tuthill as Mueller Park spokesmen pointed out that racism had no part in the issue. Tuthill said the inappropriate behavior among blacks or whites drinking beer, smoking dope or using bad language in the park was unacceptable. Atkins described the problem as more the neighborhood “toughs” than the basketball players…. Another problem at Mueller Park is that it offers few facilities for recreation… [Asst. superintendent Feldman] agreed a sand volleyball court at Mueller Park would be safer and more enjoyable for volleyball than the asphalt court currently being used. He said Mueller neighbors have legitimate reasons, and not ideas coming in from outer space, about removing the asphalt. Mary just admitted that the problems in the park were unrelated to basketball players. It should also be mentioned that removing the basketball court and replacing it with a sand volleyball court would have resulted in no net increase in the number of recreation facilities; though I can imagine it would have resulted in an emptier, less useful park. The article closes with Dennis complaining about the kids being excluded from basketball fun; followed by Dennis reserving Wednesday night court-time for a children’s activity that isn’t basketball. The neighborhood stops targeting the basketball court from roughly 1982 until 1990, when LHENA begins having one of the hoops variously hooded, capped, or locked for most of the next decade. A “vandal” (more like freedom fighter) breaks the lock off the south hoop in 1996; Glen Christianson would have been proud. Basketball: the least of your problems. In the summer of 1993, in an item headlined “Mueller Park Crowd Getting Out of Hand,” LHENA vice-president Audrey Johnson notes “there have been problems with noise, bad language, rowdy behavior, fires being started in the bathrooms and under trees, and glass being dumped in the swimming pool.” She doesn’t mention basketball, but it’s not hard for some to connect the dots. Notes from the August board meeting mention the fires, the glass in the pool, people being “accosted by hidden persons,” and the need to call the police to close down basketball. It’s possible that accosted by hidden persons is just a euphemism for good, hard defense; though it could also be the case that your neighborhood has bigger problems than basketball. In 1998, the basketball court was cut in half as part of renovations at Mueller Park. The only study I can find on the topic shows that parks with basketball courts, as opposed to those without, are “associated with lower rates of violent and property crime but not disorder crime.” Basketball courts can be noise generators, but fewer people get hurt. The whole story makes me wonder if the LHENA crowd ever regretted tearing down a half-block’s worth of houses to build this nuisance of a park. 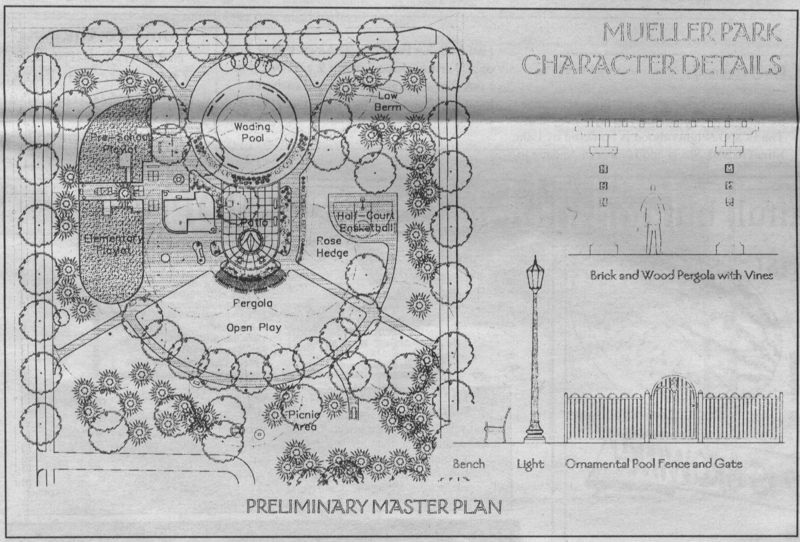 1997 renovation plans for Mueller Park. Previous posts on Wedge history are available here and here.